In the age of Cesar Milan’s “The Dog Whisperer” or the new CBS Prime-time series “Dogs in the City” where trainers with magical dog-telepathy abilities are “curing” dogs and training people, how in the world is the common-Joe of dog owners supposed to get their pups trained without making it onto the nearest television network? 1: What is their level of experience, where did they learn how to train dogs, and what is their success rate with your specific breed of dog? A professional dog trainer is like many occupations—just because they claim to be a “professional” does not mean they know what they are doing. 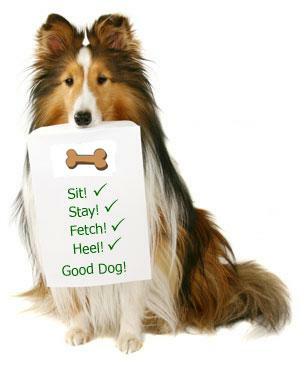 Get references from the trainer and visit those who have had their dog trained by this individual. 3: The cost. How much are you willing to spend on a professional dog trainer? While the better trainers can be more costly, please keep in mind that the size of the price tag does not always equal the value you are receiving. 4: There is also the debate between private lessons and large group lessons (offered by most pet supply stores). Keep in mind that large groups provide more distractions and can make a training session ineffective. On the flip side, practicing training in these environments can also help you learn how to handle your pup in such distractions. Ask yourself before you start – which would you prefer?